Home / Blog / Pest of the Month: The House Mouse (and why he wants to make your home his own)! Pest of the Month: The House Mouse (and why he wants to make your home his own)! If you want to know how to get rid of mice, you need to know how they think. Once you learn what mice do and don’t like, you can make sure they won’t like your home. 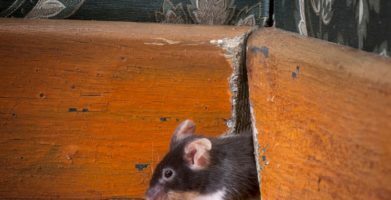 Mouse problems are most common when the weather takes a cold turn and mice are looking for a warm home, but mice can happen to anyone, anywhere. Are you rolling out the ‘Welcome’ mat for mice? Learn how to put up a ‘No Vacancy’ sign they can’t ignore! An average house mouse is small but mighty. Size is nothing but a number to the house mouse, and that number is two; he is only about two inches long and weighs less than an ounce. He can survive in the wild, but he thrives when living near people where food, water and shelter are easy to find. His short hair can be any shade of brown, grey, or black, but his paws, ears and tail are almost hairless. Jumping 18 inches in the air, climbing stairs and rough surfaces and even swimming are effortless tasks so nothing can stand in his way. A house mouse’s small size and impressive skills make him a challenging pest, but his ability to reproduce is overwhelming. Mice can reproduce before they are two months old and typically have anywhere from 3 – 14 babies per litter. A female can have 5 – 10 litters each year so it doesn’t take long for one mouse in the house to become a large infestation. The house mouse just wants a place to call home. The average house mouse is nothing short of a genius. He can squeeze through openings that are only 1/4 of an inch, which means dryer vents, chimneys, a crack in your home’s foundation or a gap underneath your door all look like flashing neon signs saying “Please enter here!” All he really wants are the same things you and I enjoy: a safe, warm home with food and water. He can eat almost anything and will make a nest out of any soft material. Just because the mouse in your house didn’t make a reservation to be your guest doesn’t mean he won’t let you know he’s staying. He is mostly nocturnal and avoids bright light, but there will be signs. You may hear squeaking, scratching or scurrying sounds as he scampers around your home. You might notice shredded paper in unusual places, or small holes nibbled into packages in your pantry. The most undeniable sign of a mouse in the house is small black pellets that are similar in shape and size to rice – mouse poop. Is the house mouse unstoppable? A little guy like this couldn’t survive long without some super skills, but one of his greatest strengths is actually one of his biggest weaknesses! House mice have poor eyesight, they can’t see colors the way we can and cannot see very far away. A very strong sense of smell makes up for their weak eyes. They use pheromones, or scent markers, to communicate with other mice and rely on scents to detect predators or other potential dangers. 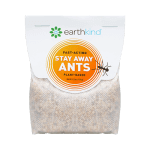 Setting traps baited with peanut butter or cheese might seem like a good idea at first, but these mouse control methods usually backfire because they are attracting mice to easy food. Poisons might seem like a good way to get rid of mice, but the risks to children, pets and other animals is very dangerous. Plus, the smell of a dead mouse rotting somewhere in your home where you can’t find or reach it is something no one ever forgets. Now here’s where knowing all about the house mouse is really going to pay off. Because mice rely on their sense of smell, you can overwhelm their little noses with a botanical fragrance that will send them running. 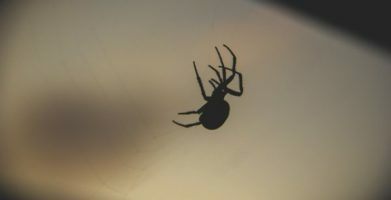 Repelling mice is the best way to get rid of mice because it is completely safe and you won’t have to worry about ever seeing a live mouse, or disposing of a dead rodent. Mice deserve a home too, just not in your house! If you want to know how to get rid of mice, you need to know how they think. Once you learn what mice do and don't like, you can make sure they won't like your home. 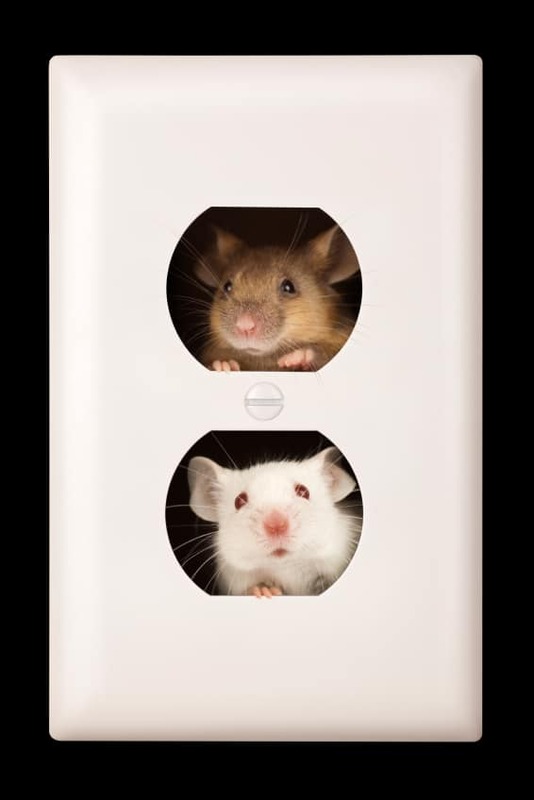 Mouse problems are most common when the weather takes a cold turn and mice are looking for a warm home, but mice can happen to anyone, anywhere. Are you rolling out the 'Welcome' mat for mice? Learn how to put up a 'No Vacancy' sign they can't ignore! A house mouse's small size and impressive skills make him a challenging pest, but his ability to reproduce is overwhelming. Mice can reproduce before they are two months old and typically have anywhere from 3 - 14 babies per litter. A female can have 5 - 10 litters each year so it doesn't take long for one mouse in the house to become a large infestation. The average house mouse is nothing short of a genius. He can squeeze through openings that are only 1/4 of an inch, which means dryer vents, chimneys, a crack in your home's foundation or a gap underneath your door all look like flashing neon signs saying "Please enter here!" All he really wants are the same things you and I enjoy: a safe, warm home with food and water. He can eat almost anything and will make a nest out of any soft material. Just because the mouse in your house didn't make a reservation to be your guest doesn't mean he won't let you know he's staying. He is mostly nocturnal and avoids bright light, but there will be signs. 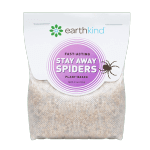 You may hear squeaking, scratching or scurrying sounds as he scampers around your home. 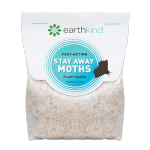 You might notice shredded paper in unusual places, or small holes nibbled into packages in your pantry. The most undeniable sign of a mouse in the house is small black pellets that are similar in shape and size to rice - mouse poop. A little guy like this couldn't survive long without some super skills, but one of his greatest strengths is actually one of his biggest weaknesses! House mice have poor eyesight, they can't see colors the way we can and cannot see very far away. A very strong sense of smell makes up for their weak eyes. They use pheromones, or scent markers, to communicate with other mice and rely on scents to detect predators or other potential dangers. 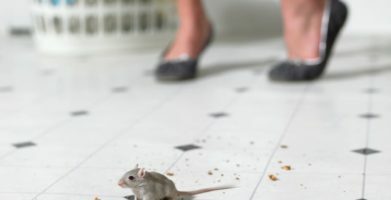 Setting traps baited with peanut butter or cheese might seem like a good idea at first, but these mouse control methods usually backfire because they are attracting mice to easy food. Poisons might seem like a good way to get rid of mice, but the risks to children, pets and other animals is very dangerous. Plus, the smell of a dead mouse rotting somewhere in your home where you can't find or reach it is something no one ever forgets. Because mice rely on their sense of smell, you can overwhelm their little noses with a botanical fragrance that will send them running. Repelling mice is the best way to get rid of mice because it is completely safe and you won't have to worry about ever seeing a live mouse, or disposing of a dead rodent. string(80) "Pest of the Month: The House Mouse (and why he wants to make your home his own)!"